A picture says a thousand words. Or in this case, a picture provides all the necessary information about a brilliant upcoming gig in Leeds next month. 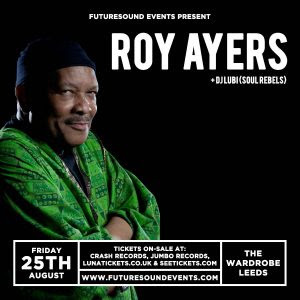 Described by Erykah Badu as 'the KING of neo-soul music', Ayers' gig in Leeds is sure to be packed. Tickets cost £25 and can be bought from the Luna Tickets website as well as the outlets listed on the poster above. To find out more about Roy Ayers, visit his website.